So, here it is! The last day of 2013! This year has been a difficult one for all of us with the loss of Di Huck in February. 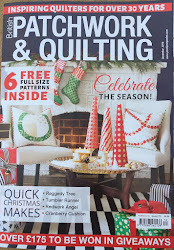 Di WAS Patchwork & Quilting magazine. She was the driving force behind it. Although her influence has been sorely missed, life does go on and the magazine has continued to go from strength to strength. 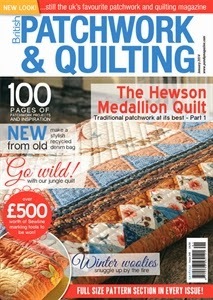 By now many of you should have seen our new look January issue which came out just before Christmas. The magazine has a new clean modern look but still has all your favourite articles and features. We are particularly pleased with how the projects are looking; giving you all the information you need to make a particular project on one double page spread. Looking forward to 2014 we have a special celebration later in the year as the November issue will be our 250th issue! Lots of plans are afoot for exciting ways to mark this occasion. A new year is traditionally a time to reassess our lives and to set ourselves resolutions. Quilting resolutions are much more interesting than losing weight, giving up smoking etc. For myself, this past year I have managed to be more productive in my quilty finishes, mainly because I have taught myself to machine quilt. For 2014 I think I would like to try and find the time to make more quilts for me............including finishing one I started over ten years ago! 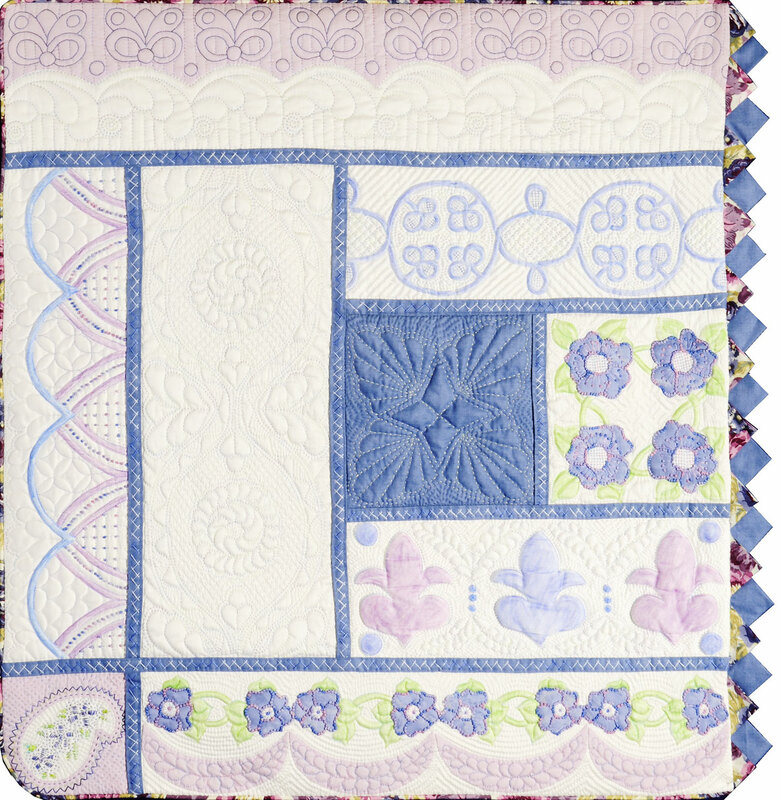 So what are your New Year Quilting Resolutions? Leave a comment on this post and I'll see if I can find a prize in the offices for one lucky commenter. Closing date will be 12 noon Tuesday 7 January 2014. So from all of us at P&Q, a very happy and peaceful New Year! Well not ALL change, at least not yet! If you have picked up a copy of the December issue, you will have read that Judi is leaving the magazine so she can spend more time teaching and travelling. The last couple of years have been quite difficult what with Di's illness and then her sad passing and Judi and I were thrown together at that point. And whilst we had both worked together on the magazine for a year or so, we had both tended to work via Di who had overseen the running of the magazine, so our paths didn't cross over much. But the great thing was and has continued to be, that we made a great team. We have agreed on everything and have been in sync in every way, even when its a moan about something! And that has made running the magazine so much easier. I will be sad not to be working with Judi on a regular basis but am pleased to tell you she will continue to be contributor to P&Q, hopefully a regular one......! Emma Horrocks is our new assistant editor and will be taking over Judi's share of the magazine. I have to say, despite not working in the magazine industry before, she is an absolute natural and is going to be a fantastic asset to P&Q. We already have the makings of being a great team and I am going to enjoy working with her. And so starts the next chapter in the life of P&Q! as chosen by my random number generator........lucky number 7! Congratulations Kate! An email is on its way to you! Thanks for all your lovely comments. Let's do this again sometime shall we? To coincide with the launch of this year's special issue bookazine, we have a little giveaway for you! 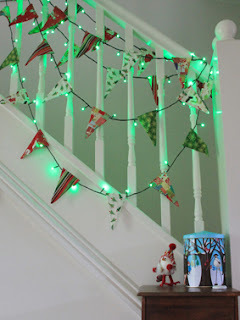 Fabulous Festive Makes is ......well it is rather fabulous for starters and features over 25 festive projects for you to make, including some quick makes for those of you who don't have much spare time on their hands and lots of lovely decorations. 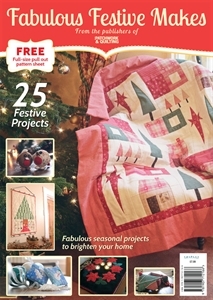 The bookazine will launch at the Festival of Quilts next week so pop along to our booth, E32 to pick up your copy and get those festive preparations started early this year! Both Judi and I have made projects for the magazine and here is a sneak peak of mine.......Christmas Bunting with a difference! The fabrics for my project were kindly donated by Makower UK Ltd Ltd and they were generous enough to give me a little bit extra so I could give some away to one of our lucky readers! So we have a bundle of six long quarters just waiting for a new home. We have some exciting news to share with you! The website now has a new download facility where you can download the Pattern Section from each issue of the magazine for FREE! Take a look at the page here. This is really good news if you have a digital subscription. Read the digital version of P&Q on your iPad or other device and then download the patterns on to your pc so that you can print them off. You will need Adobe Reader in order to view the Pattern Sections. A link to download the programme is provided on the web page but most pcs come with it pre-installed. All you need to remember when printing off any patterns or templates is to ensure you set your print settings to "actual size" or with no scaling so that they are printed correctly. The archive of Pattern Sections goes back to May 2011 which is the first digital version of the magazine available. If you haven't tried the digital version before, you can buy a copy here, including the latest issue. As we often say in the magazine..........enjoy! I've often likened to working for the magazine as being on a rollercoaster. It can be relentless and non stop, but it's also great fun; every now and then you feel like you would like to maybe step off the ride but you know it's difficult to get back on again! .......than she had to get most of her copy done for the June issue before leaving for the States and a P&Q Tour to Paducah. I think she gets a night at home before leaving again to help out at the British Quilt & Stitch Village show in Uttoxeter! We'll blog about that in a couple of weeks. It's going to be a great show! But with all this rushing around we have agreed on one thing; we are going to have an editors' day out! Just the chance to get together and talk quilts and not deadlines. 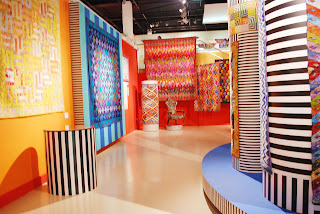 Having proofed a review of the Kaffe Fassett exhibition at the Fashion & Textile Museum in London for the May issue, we decided that's where we would go.........luckily it's on until June! It should be a feast of colour and I am particularly looking forward to one room that features some of his working sketches, colours and designs. I love to see the design process of an artist. So here's to a day off! Many of you may already have heard the sad news we received last week, that Di had lost her fight with cancer. She passed away peacefully last Tuesday. Judi and I, her family and everyone at Traplet Publications have been very touched by the messages of condolence from you all. 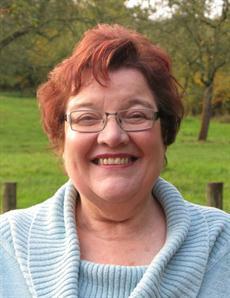 Di was a remarkable woman who, along with Elaine Hammond, started our magazine back in the 1980s. It was the first of its kind in the UK. 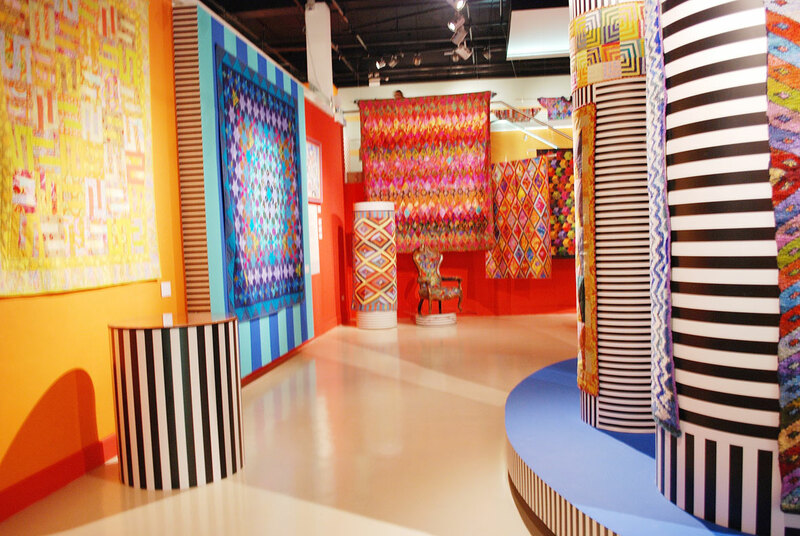 This led to the creation of Quilts UK which is still one of the country’s best loved quilt shows. She also organised tours to quilt shows all over the world through her tour company P&Q Tours Ltd.
A lot of what stands for patchwork and quilting in the UK today, is thanks to Di. Another of her achievements was setting up the Amy Emms Award, awarded each year at Quilts UK to someone for their ‘Services to Quilting’. Many unsung heroes as well as renowned quilters have received this award over the years. The funeral is this Friday (8th March) in St Andrews Church, Evesbatch close to where Di lived. She touched so many people through our craft that it may be standing room only. The family have asked for family flowers only, but if anyone would like to make a donation instead of flowers these will be split between four charities: Friends of Tewkesbury Hospital, St Michael’s Hospice, The Quilters Guild and St Andrews Church. Donations can be made specifically to one of the charities, in which case please make your cheque payable to the charity, otherwise make the cheque payable to Hawcutt Funeral Directors and they will apportion the donations between the four. All cheques should be sent to Hawcutts. A Just Giving page is being set up in Di’s memory in favour of St. Michael’s Hospice. We’ll blog details of this as soon as it’s ready. Judi and I will continue to carry on her work. These last few months we have made a great team putting the magazine together for you, scarily nearly always agreeing on everything and Judi will continue to run P&Q Tours. Di Huck will be sorely missed. 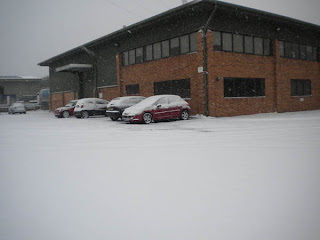 As I write this post, most of the UK has been covered by a blanket of snow which is something that doesn't happen very often. The offices in Malvern got quite a bit as the worst hit areas were in the west of the country. Thanks to Paul Williams for braving the car park to take the photo! I live in the east where we got off quite lightly with only an inch or so of snow, but still enough to close schools early. Judi and I are busy working on the March issue at the moment and this week we did some additional photography work in Judi's new flat which has a wonderful lounge with large windows. She's just moved again, not far this time though, but has been without internet access for a short time. We are so reliant on the internet these days that it is hard trying to cope without it! Most of you should have received or seen the February issue which is out now; I hope you like the heart themed projects we put together for you. Making a project with hearts doesn't have to be for Valentine's Day of course, but is also a way of showing someone that you care. One of the first main quilt shows of the year starts next week at the South of England Showground in Ardingly, West Sussex but don't forget quilt group exhibitions also make a great day out! We are always happy to advertise your local shows in the magazine, just email details to me. They also appear on the website too! Go on..............you know you want to! Wow! Already one week has passed in 2013! The February issue has gone to the printers......which means Judi and I are now full of the joys of spring as we hop, skip and jump headlong into the March issue! 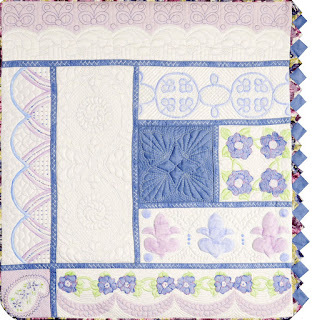 From all reports, you have been really inspired to take part in Jacquie Harvey's new block of the month programme that started in the January issue. 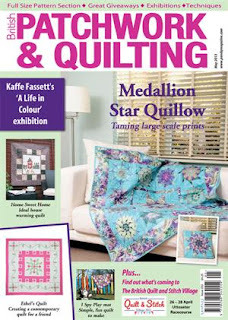 If you want to practise your hand quilting skills or have ever wanted to know what techniques Jacquie uses to make her award winning quilts, then this is the project for you! As we start this new year, what are your favourite parts of the magazine? Is there anything you want to see more of? We love to hear from you and see the things you have made both from the magazine and elsewhere. Think you have made a quilt that other readers might like to make? Why not submit a photo to us by emailing pq at traplet dot com and it could be you and your quilt in a future issue! So get involved........and get quilting!